Now the dust has settled after BGS 2017, the biggest gaming event in Latin America which took place between October 11 and 15, 2017, it’s time to do a review about the event that brought to Brazilian fans of Xbox a taste of what’s coming to our favorite gaming platform. 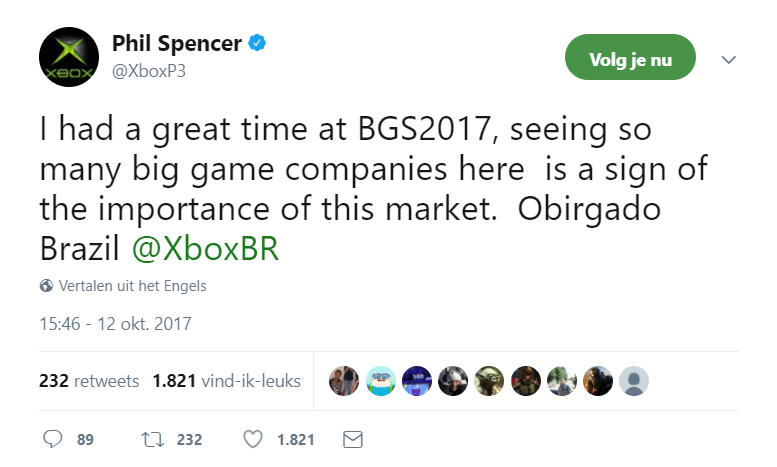 Yes, the head of Xbox himself, in his second visit to Brazil, gave us the pleasure of his presence at the event. Alongside with legends of the gaming industry Hideo Kojima and Ed Boon (I’m sure you know really well who they are), they cut the tapes that started the event. Between talking at the stage of the first Xbox FanFest, posing for pictures, playing games and receiving the Lifetime Achievement Award, Mr. Spencer shared what every Xbox Brazilian gamer have been waiting to listen since its first announcement: Xbox One X will be available in Brazil until the end of 2017 (awwyeah!). Xbox stand was without a doubt the most crowded of the event. In long lines that took more than three hours, gamers waited to try some of the upcoming and most recent titles for Xbox. FIFA 18, Cuphead, PUGB, Assassin’s Creed Origins, Dragon Ball FighterZ and Shadow of War were some of the most contested, while in small lines you could try Shine, Riders of the Broken Planet, Minecraft and many other games. One of the two biggest lines in Xbox stand was for Sea of Thieves, which looked wonderful (with one of the most impressive oceans I’ve seen in a game) and everybody who tried were praising it. An honorable mention to The Skullduggers, a band dressed as pirates that performed during the event. The other one was the line to the Xbox One X devkits were you could play Forza 7, with even more outstanding visuals than the version already available. In another area you could try games from the extensive list of titles present in Xbox Game Pass. Those who did it received codes for free months of Xbox Game Pass to try the service. There were also championships of Killer Instinct, Gears of War and Rocket League, which attracted many competitors fighting for very cool prizes like special edition controllers. It’s great to see how much Microsoft supports their Brazilian fans. Sometimes they forget about us (did you know that Xbox One S was released in Brazil only on September 2017 while the rest of the world had it released one year before? ), but they’re trying to apologize by releasing Xbox One X in time for Christmas. It doesn’t matter if you’re with your old Xbox 360 (like me), the original Xbox One (like me too), the upgraded Xbox One S or eagerly waiting for the beast to arrive at the end of this year (like me… again). Remember you’ve chosen the best gaming platform for you.